Awesome person, made the ceremony fun and beautiful. Reverend John made our special day one we will never forget. Being from out of state, he accommodated our wedding plans and made us feel right at home in Texas. My husband and I were married in AT&T Stadium on the 50 yard line. John made us feel so special on our wedding day and catered to our every need. I highly recommend this kind gentleman for your ceremony. He is responsive and caring and added a genuine special touch to our ceremony. He even took pictures for us too! We are forever grateful, John. God Bless! This section will not be published so any words you wish to pass on. You are amazing. Thanks again! Something touched me about Rev John once I read his website and then after our initial phone call. I new immediately he was the one to guide us through this special time. Our Ceremony was beautiful, heartfelt and completed us. Our guest all commented that it was the best ceremony that they had ever attended. Asking for his information so they could recommend him in the future. Reverend John Barker has a beautiful spirit, wonderful sense of humor and a STRONG presence. We strongly recommend Reverend John Barker to all.. Try and get on his calendar. 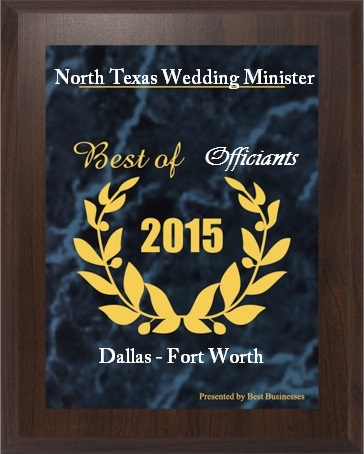 You may have to make your reservation far in advance but you will have the BEST wedding officiant/minister/FRIEND presiding over your ceremony. Review is posted on WeddingWire.com and Google above. Reverend John, to borrow other reviews, is larger than life with an amazing deep voice, gentle soul with a Goliath heart. He took control when our wedding planner ran late. Organized the musicians, checked the sound system. talked me off of the edge, settled my mother, and best of all firmly explained our's was a cel phone/twitter/selfie free ceremony. He had to prompt me, gently, during the vows for I was so struck by the moment. Thank you Try and get on his calendar. You may have to make you reservation far in advance but themn you will have the BEST wedding officiant/minister/FRIEND presiding over your ceremony. Awwwww Thank you for the kind words. Your ceremony was so lovely. I remember the look on your father's face as he choked up when I asked "Who gives this woman to this man?" The coordination was flawless, more to the professionals your planner hired vs my last minute touches. Again thank you. I am so pleased that I was given the opportunity to be of service. Absolutely the best experience. We were so close to having a "courthouse" wedding but decided to use Rev. John's Kiss and Run package instead. I would not trade it for anything! Rev. John took the time to get to know us, was sincere, fun, full of joy and made our short and sweet ceremony one I will never forget. I would recommend him to anybody any day. Thank you again Rev. John, and I wish you all the happiness in the world!! John made our day very special. He gave us all the flexibility in the world as we planned to run out to the statue in Addison Circle but had to call a last minute audible due to weather. You will definitely be in good hands with John no matter what type of ceremony you are looking for. Mr. Barker is a tall man with a very deep voice and a really kind heart. He was perfect for the wedding. Rev. John Barker was so incredibly excited for our day! Instantly made us feel like family and I felt confident knowing that he would make the ceremony fun-loving and meaningful. With all the craziness he was the one thing I didn't have to worry about! Totally made our wedding day special. If you can get him do it, you won't be disappointed. We opted for the "Kiss and Run" package at Addison circle for $95. My hubby and I just wanted to get married! It was incredibly romantic but a bit scary to literally "run" lol, John was able to meet us last minute in Addison Circle for the ceremony. He suggested the Blue Arch sculpture in the center circle and it was just so beautiful at sunset! An absolutely perfect, somewhat spur of the moment (way too long of a story to write here) experience. John is so funny and nice. You can tell he really cares about making you happy, even if it's just for a short amount of time! I think we all cried a little and one point, it was awesome. Definitely recommend! Rev. John and his Kiss and Run ceremony was wonderful! We were so close to having a "courthouse" wedding but im glad we ended up using him instead. He took the time to get to know us, was courteous, caring and fun. We eloped, and I wouldn't trade our experience for anything. Thank you again! Reverend John Barker is an amazing soul. Very formal wedding. Reverend John Barker took it all in as a true professional. He let us go over the top with our custom vows. Calming effect on us that made our ceremony flow with ease. He truly took our service personally. You can do good but never BETTER than Reverend John Barker for your formal or for any wedding ceremony. John Thank you so very much. The Rev. is the sweetest and is very efficient. Reverend John, to borrow other reviews, is larger than life with an amazing deep voice, gentle soul with a Goliath heart. He took control when our wedding planner ran late. Organized the musicians, checked the sound system. talked me off of the edge, settled my mother, and best of all firmly explained our's was a cel phone/twitter/selfie free ceremony. He had to prompt me, gently, during the vows for I was so struck by the moment. I just watched the video of our ceremony and know that John was the glue that kept us all together. I'll send photos, as promised, when they come in next week.